I am so happy to announce that in addition to all of the other press my blog WHAT I WORE: tip to toe! 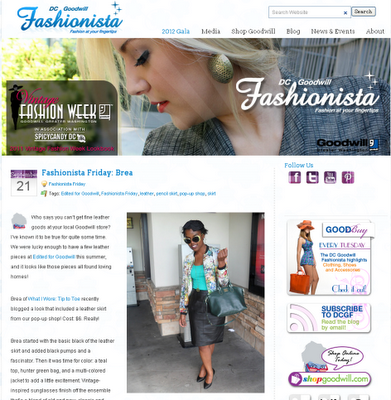 has been receiving lately, I was chosen by Goodwill of Greater Washington as their Friday Fashionista. The flattering write-up highlighted the vintage leather pencil skirt I purchased during the Edited for Goodwill Pop-Up shop VIP party. I'm in great company too! Bloggers like Lauren of Haute off the Press, Oby of Fashion | Art | Crafts, Etc. and Deb of Real Girl Runway have all been featured. If you want to snag your own fab fashions from Goodwill check out their online shop or buy a ticket to the 2012 Fashion of Goodwill Runway show and charity gala, which will feature their second Pop Up shop, happening Thursday Sept 27 at 6PM. Congrats again. Ya look Fab!